Context: more audio while working in the kitchens at Horsleys Green. Immediately after finishing the Big Sleep, I went straight on to listen to this. I was disappointed in the story actually. Yes, there was Marlowe and, as before, he was hard and cynical and cool. But this novel(la?) just didn’t catch me up in its world as much as Sleep had done. Perhaps I was used to it by then. The plot’s not as convoluted as Sleep but it does have its own twists with the, now, inevitable secrets coming to light. I won’t spoil it for anyone planning to read it. There are still great lines from Marlowe. Not as many as in Sleep but still some amazing similes in particular (see quotes below). 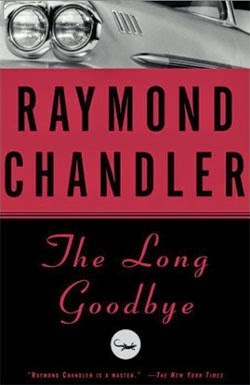 Reading the first Marlowe novel and then the last immediately after it, I was struck with the contrast in his attitudes and relationship across the books which made me reflect again on Chandler’s genius. There’s much more of a contempt for so-called law enforcement, much more a hatred of everything that makes California society what it is known for. And I wonder if this is what Chandler experienced in real life. Whatever its inspiration, the progress of character development in Marlowe from Sleep to Goodbye is excellent and I’m glad I read it to at least see that. The first time I laid eyes on Terry Lennox he was drunk in a Rolls-Royce Silver Wraith outside the terrace of The Dancers. I felt as out of place as a cocktail onion on a banana split. I never saw any of them again — except the cops. No way has yet been invented to say goodbye to them.